Started in Arlington, Virginia in 1987, and now designing and remodeling kitchens in Arlington, Alexandria, Falls Church, McLean, and the surrounding Northern Virginia areas, Merrill Contracting & Remodeling offers the kitchen remodeling experience, innovation, personal service, and professionalism that have made the firm one of the area’s most-trusted custom kitchen remodeling contractors. 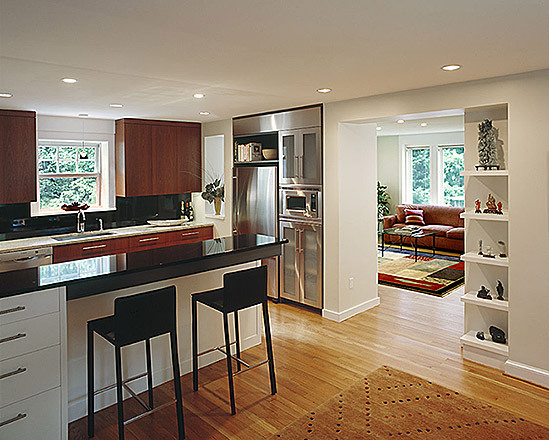 We provide design build custom kitchen remodeling services in Arlington, Falls Church, Alexandria, McLean, Fairfax and other areas in Northern Virginia. From grand-scale custom kitchen remodeling to more modest kitchen renovations and facelifts, we approach remodeling a kitchen as an opportunity to turn our clients’ kitchen needs and ideas into beautifully designed and highly functional dream kitchens. Plus, as a full-service design-build kitchen remodeler Merrill can handle every aspect of your kitchen remodel, from concept through completion. And, we can guarantee your kitchen will be done on time and on budget. Can designing and remodeling a kitchen that has that “WOW” feeling really be…easy? Yes, with Merrill it can! Working with our AIA architect and kitchen designer (or yours! ), we can design and build a new kitchen for you that has today’s “wow” factor, plus with all of today’s latest kitchen functionality and practicality. A kitchen remodel that will serve you well for many years to come. Best of all, Merrill offers even more than outstanding custom kitchen design, craftsmanship, knowledge of products, attention to detail, guaranteed pricing, and a generous warranty. We can provide you with everything you need for your kitchen from imaginative design to quality kitchen cabinets, to custom counter tops and all kinds of sink options, cook tops and ranges, ovens, and more. We’re one of the few kitchen remodelers in Northern Virginia whose kitchen remodeling professionals have worked with our company for many years. You can trust us to take the stress and hassle out of kitchen remodeling so you can actually enjoy the process of getting a beautiful custom kitchen. Let’s talk about remodeling a custom kitchen for you.